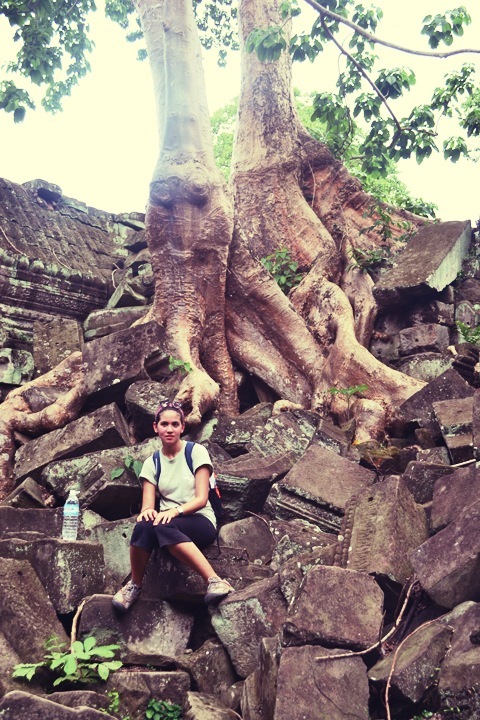 When planning our 3 days in Siem Reap, I knew I wanted to do a guided tour at some point to learn the history behind the temples. I also knew I wanted to do something active. I love to explore by foot and I love physical challenges. My favorite way to explore a new place is to walk around with no particular agenda and get lost off the beaten path. So when browsing Trip Advisor, I zeroed in on the Angkor Off-Road Bike Tour offered by KKO, a non-profit NGO in Siem Reap. At first Carina was hesitant. I mean she puts up with me wanting to bike around for a few hours but an all day bike tour through the dusty roads of Cambodia? Girl, please. Apparently I am a master persuader because she agreed to this athletic endeavor. Things were bound to get interesting. Even I was a little nervous after our completely wearing ourselves out the day before. The morning after our day-long temple tour, we laced up our sneakers, slathered our bodies in sunscreen and filled a backpack with snacks and water bottles. After getting lost for a bit, we arrived at KKO just in time for our 8:30am reservation. We were surprised to learn that we would be the only two people on the bike tour led by a skinny local kid called Ploy. Unexpected private tour? Cool! Wearing only flip flops, Ploy helped us onto our bikes and began pedaling with ease down the busy street. Oh okay, I guess we should follow him. No helmets? Ok that’s fine. Breathe. Pedal. Don’t get hit by tuk tuks. This will be fun right? After 10 terrifying minutes biking down the crazy streets of the city, we made it safely to an unassuming dirt path. The sounds and smells of the city began to fade away as we entered the lush vegetation of the surrounding countryside. This was the side of Cambodia I wanted to see. 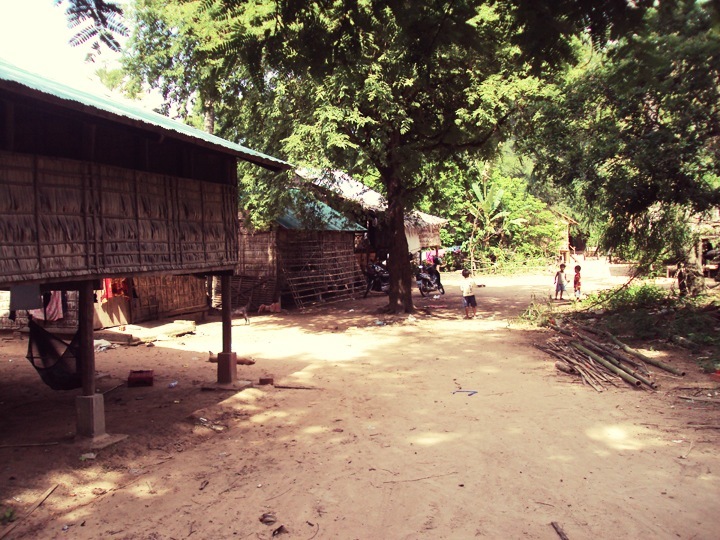 Eventually we came upon a small village with wooden houses on platforms, clucking chickens and rambunctious children playing in the dirt. They waved at us with glee and came towards us with outstretched hands. Smiling and shaking our heads, we pedaled away from the children and into the jungle. A little bit ahead we came upon the village school, a one room building with a tin roof and walls thatched together with palm fronds. Dozens of children sat in rows of wooden benches while a teacher yelled over the dull roar. 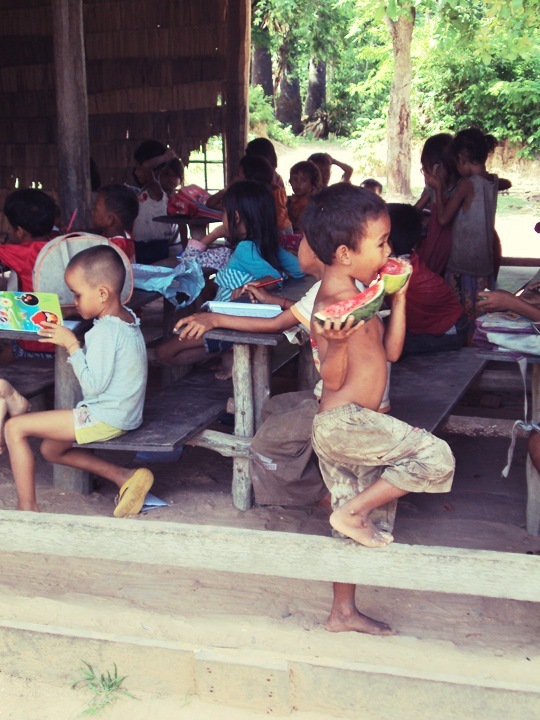 Some kids sat with their heads bent over their books while others wandered around the room, balancing on wooden beams and running around patches of dirt outside. In the middle of all this controlled chaos, a little boy wearing only dusty pants sauntered over with slices of juicy watermelon in his hands. 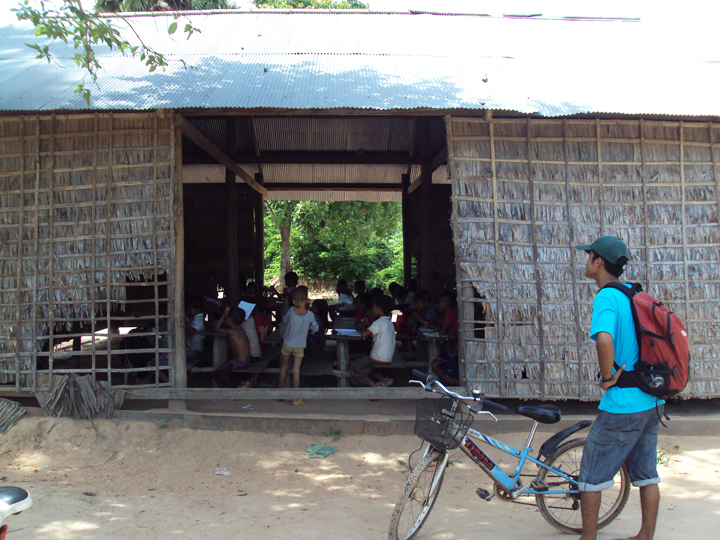 While the teacher led the children in a recitation of the Khmer alphabet, the little boy stood casually against the doorway, watching the scene with mild disinterest and munching on his fruit. While we watched this funny scene unfold before us, Ploy quietly explained the challenges of learning the Khmer alphabet and his own experience in school. I couldn’t even imagine what it would be like attending a school like this. Although I could imagine eating watermelon all day. Leaving the children to their studies, we hopped back on our bikes to make our way towards the temples. Balancing on narrow lanes of packed dirt between rice paddy fields full of water and lazy cattle, I was sure that I would lose my balance and tumble into the stagnant water. 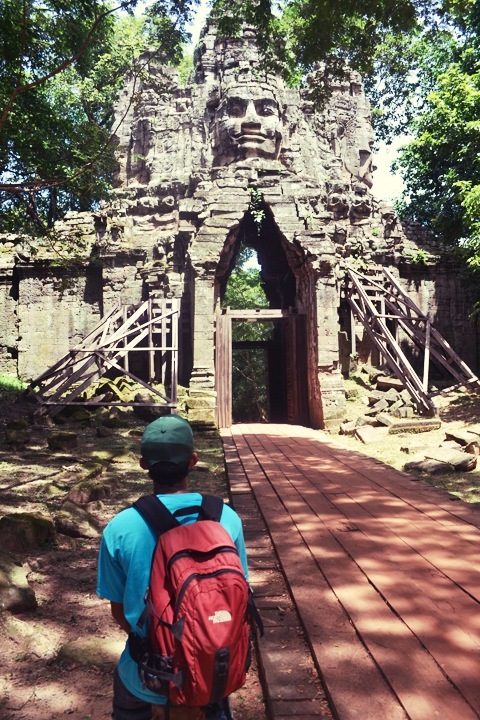 Somehow I managed to stay on the path that soon enough turned back into paved road at the South Gate of Angkor Thom. Maneuvering the rice paddies was the easy part. Next we followed Ploy up an impossibly steep hill (or should I say dirt mound) to an elevated dirt path on top of the walls around the Angkor Thom complex. While Ploy deftly dominated that hill, Carina and I attempted to ascend for approximately 2 seconds before jumping off our bikes and walking up the hill. No shame. Reaching a dilapidated watch tower at one corner of the wall, we stopped to rest. The heat was brutal and the exertion was killing us. And we had only been biking for an hour! Ploy showed us the incredible Mimosa pudica herb that closes it leaves when you touch it. Carina and I were mesmerized by this shy little plant and spent several minutes stroking the leaves and watching them retract and re-open minutes later. Crazy! Mounting our bikes once again, we pedaled farther along the wall and through the trees until we began the descent. White-knuckling the handlebars, we somehow made our way down the steep and rocky slope without getting off our bikes! Success! 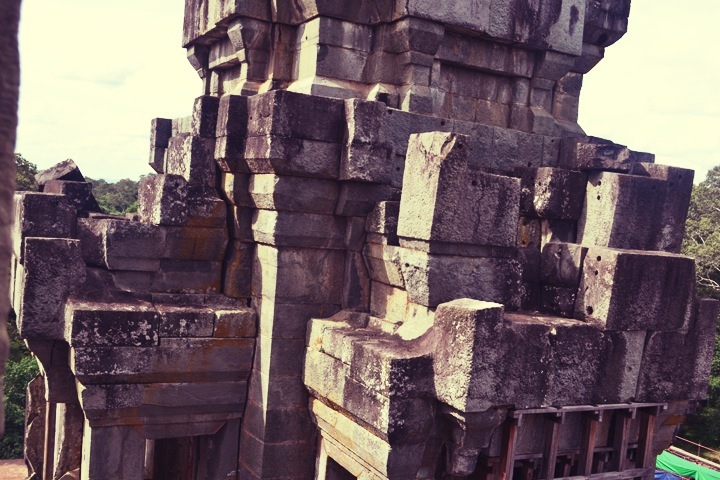 The West Gate of Angkor Thom awaited us at the bottom, watching our struggle with a grin of amusement. 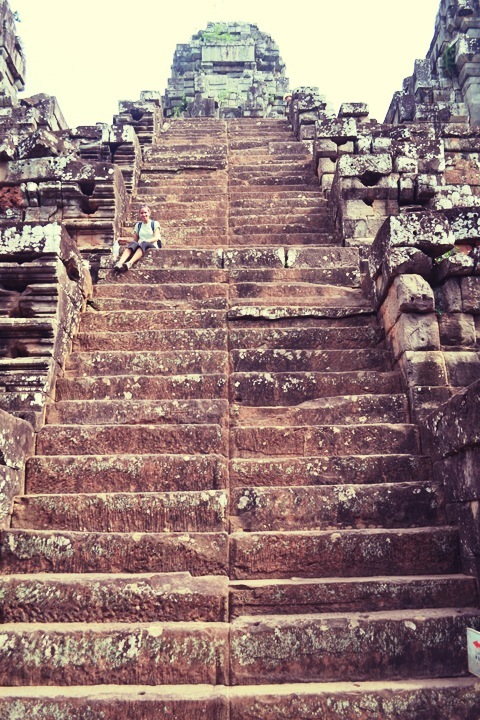 Now at the West road used mostly by locals, we headed back to my favorite temple from the day before, Bayon. 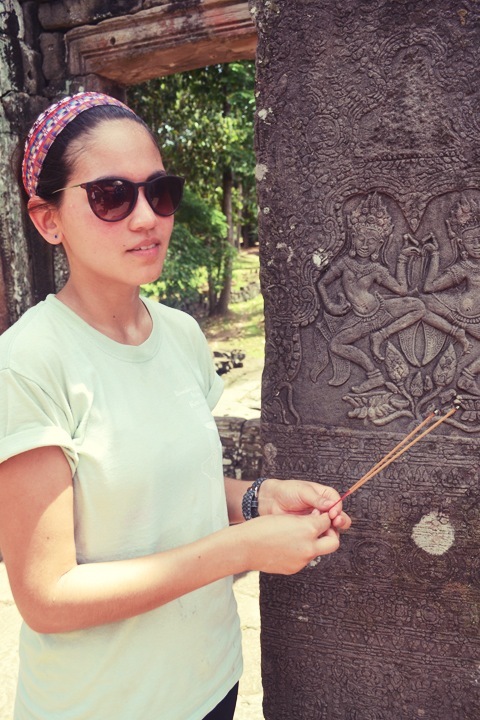 While Ploy took a nap against a tree, Carina and I walked up to the great entranceway and lit incense as an offering. In exchange for a few Riel coins, a Cambodian woman gave us a stick incense and tied red string around our wrists, providing protection and strength. 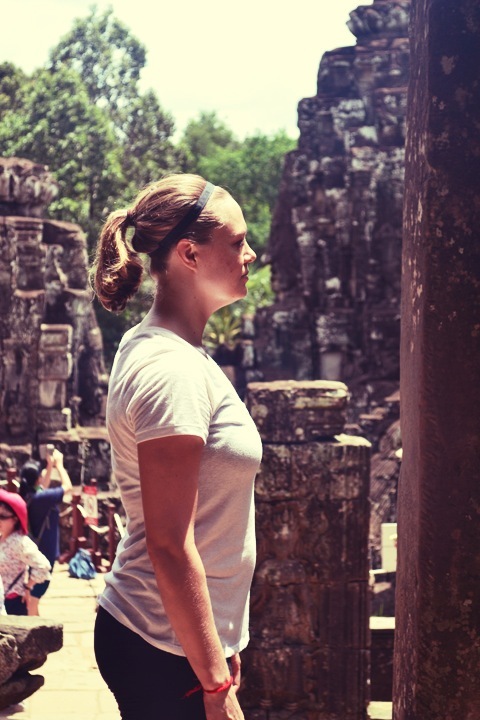 Happy to be back at Bayon Temple, we spent most of our time slowly wandering the halls and taking in the peaceful atmosphere. We even had a face-off with a particular stone face which decidedly beat us both in a staring contest. We weren’t sore losers. I mean, he’s had hundreds of years to practice. 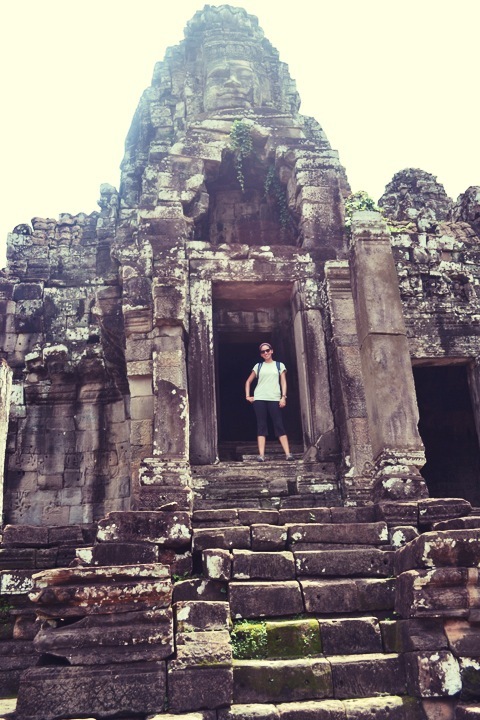 After some time inside Bayon, we woke up Ploy who took us to lunch in the Angkor Thom complex. We devoured coconut curry in a small section under a long open-aired awning housing competing restaurants side-by-side. Each “restaurant” consisted of a woman preparing delicious food in a wok and another man or woman serving the food in their section. While we ate, Ploy told us about his life in Cambodia as a university student and his desire to be a journalist. I was inspired by his determination and hope he achieves his dreams. With food in our bellies, we started the actual off-road portion of our Off-Road Tour. Leaving Angkor Thom and tourist buses behind, we pedaled deeper into the jungle. Hearing only the sound of my breathing, the crunch of dirt under my tire and the buzz of cicadas, I savored the burn in my legs and the sweat streaming down my back. At last, we were the only people around. Suddenly the jungle opened up, revealing a forgotten stone gateway with crumbling stone archways and overgrown vegetation. We stopped to admire this hidden structure before moving on. We had so much more to see! Continuing along the empty dirt pathway, we stopped at various temples along the way. 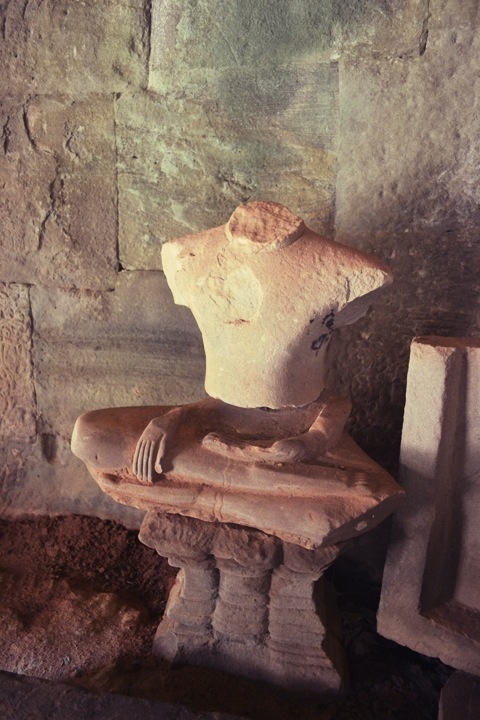 Since these temples are off the beaten path and removed from tourists, they are in various states of deterioration, only adding to their charm. 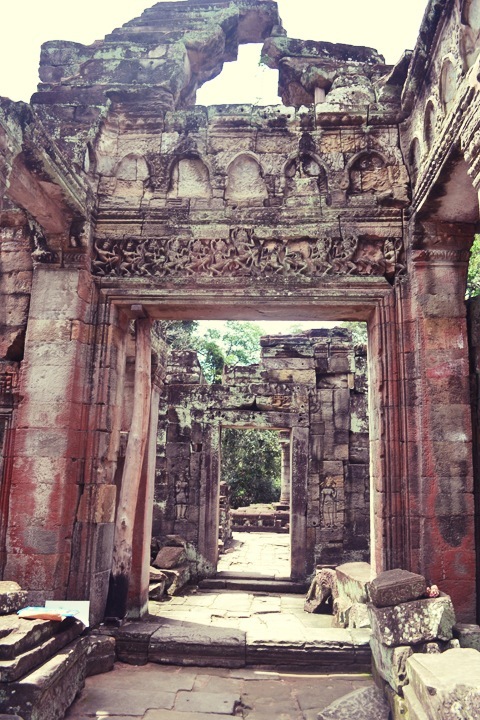 Although temples like Angkor Wat have been restored to their former glory, I enjoyed these forgotten and dilapidated temples so much more. 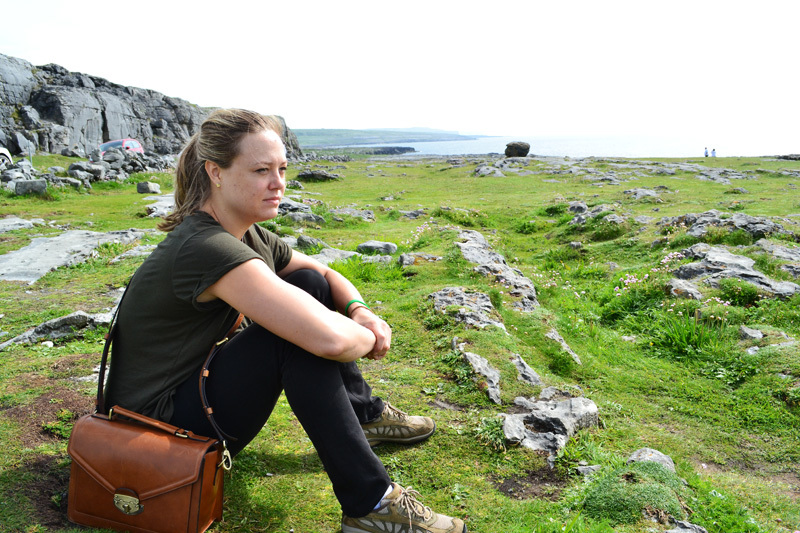 They have character (and no tourists!). 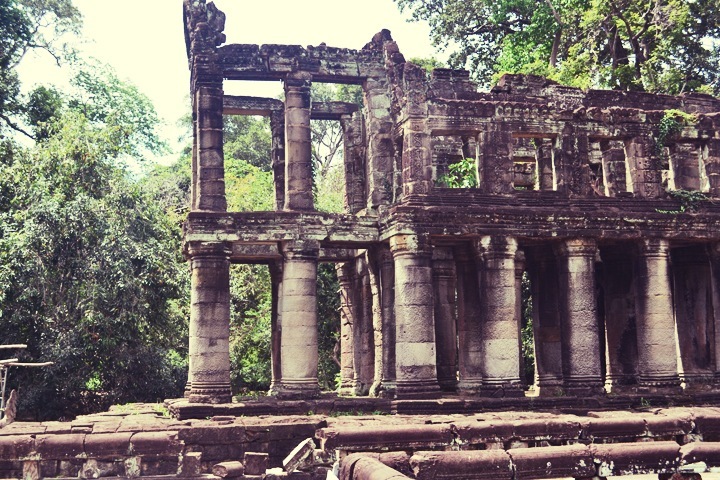 One of the temples we explored was Preah Khan. The enormous trees sprouting from its walls captured my attention and ignited my imagination. 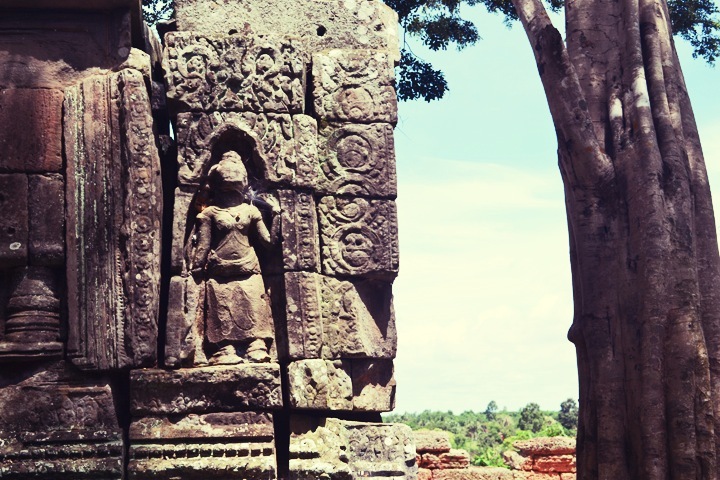 We could even see the religious transformation of the Khmer empire through the many bas-reliefs in the Hall of Dancers. 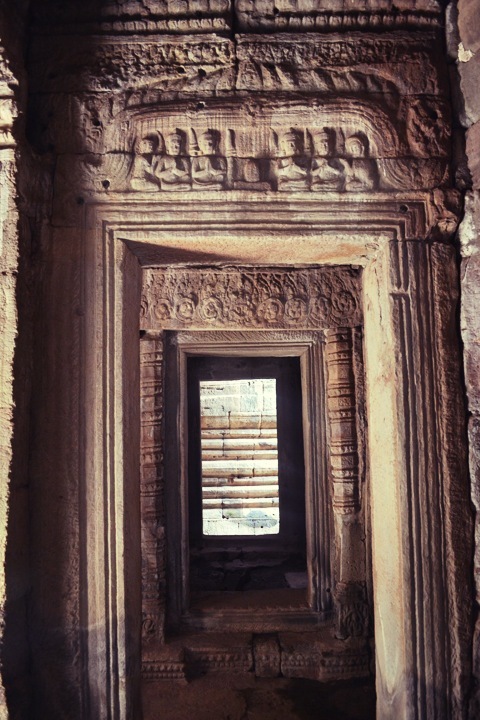 All of the carvings of Buddha had been partially destroyed and carved again to look like dancing Apsaras, Hindu spirits. That’s one way to recycle! 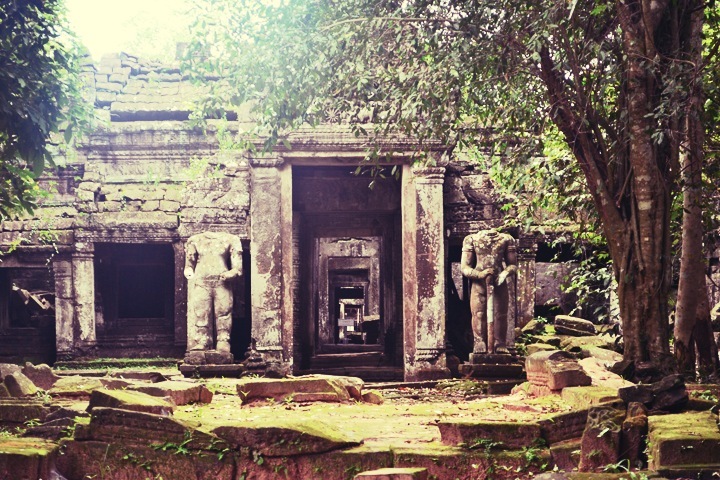 Preah Khan also has the only two-storied structure in any temple in Siem Reap. The rounded columns most closely resemble Roman architecture which might have been an influence. 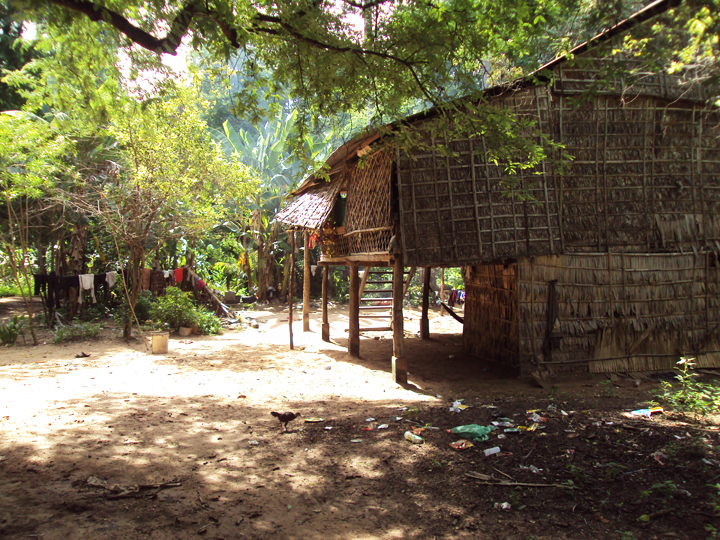 We biked on through grassy fields and open dirt pathways, occasionally passing local Cambodians on foot or on bikes. Now and then we would find another temple and briefly explore it by foot, then move on again. At one point we crossed the Siem Reap River over a concrete dam while carrying our bikes. I thought I was going to fall! But once again we avoided catastrophe. We were pushing our luck. At this point it was early afternoon and beyond hot and humid. My white shirt was now a light brown color and completely soaked through with sweat. We tried to stay hydrated by chugging water like crazy but were basically sweating it all off. Surprisingly, we didn’t care. We were having too much fun! Probably 5 hours or so into our insane bike tour and after Carina took a spill on an evil gravel patch (ouch), we reached our final temple of the day. 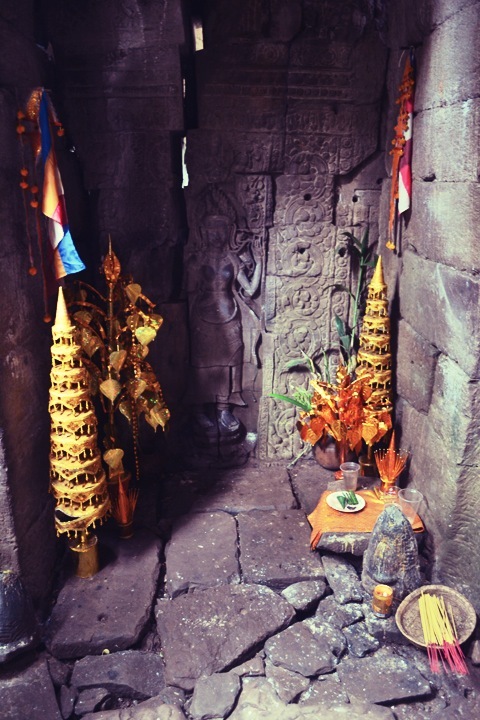 Ta Keo temple appeared like an enormous mountain, rising from the ground in an explosive block of sandstone. It was awesome. 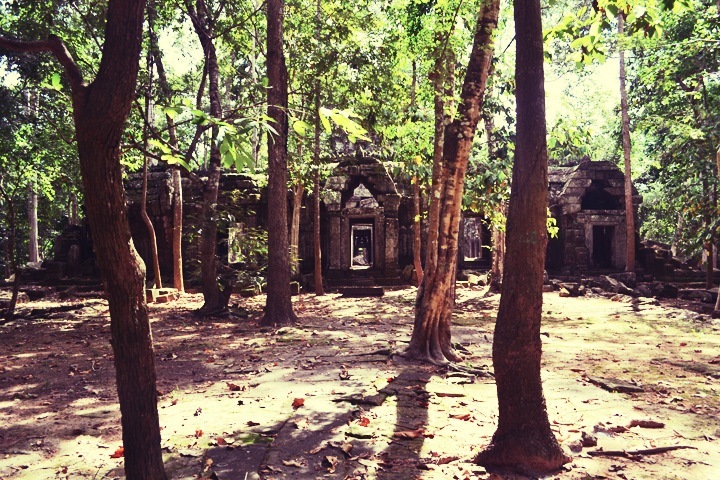 Ta Keo completely lacks any external decorations or carvings after work was abandoned around 1000 A.D. As a result, the temple retains its basic building blocks structure, adding to its enormity. I felt like a tiny little Lego person, clinging for dear life on an enormous Lego mountain. 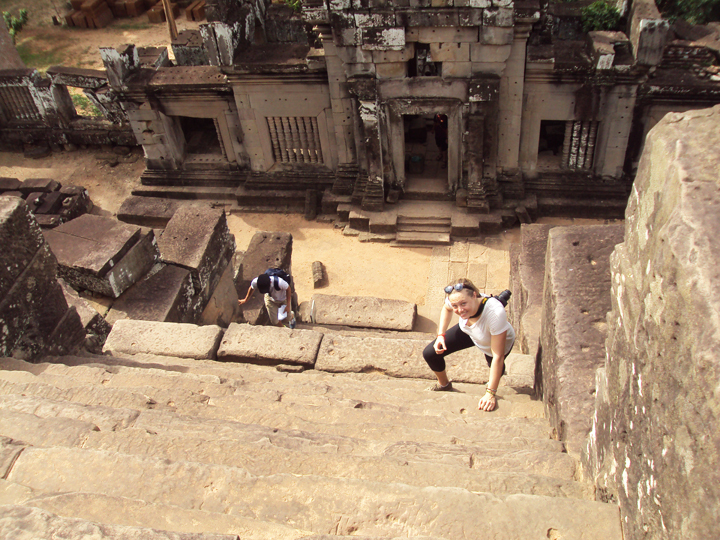 Climbing the stairs to the first and second levels took extreme exertion and confidence. These stairs were enormous and insanely steep which is not a good combo for this heights-fearing girl. But I pushed my fears aside and kept my gaze forward. At the top of the temple-mountain, we were confronted with a spectacular view that was well worth the ascent. It was now late in the afternoon and we were exhausted. It was time to bike back to the city, take a long and soapy shower and crawl into bed before dinner. 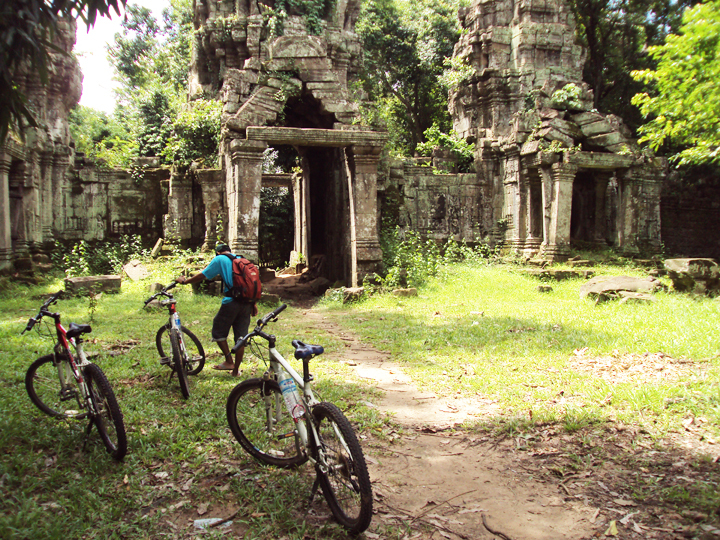 But as we pedaled along the walls of Ta Prohm, tragedy struck. Carina’s front tire burst without a warning, leaving us stranded on the side of the road. “Oh crap”, we thought. Somehow we spend hours mountain biking over ridiculously difficult terrain without a problem, only to be sidelined in the final stretch by a flat tire. What are the odds? Ploy was a champ and fitted Carina’s bike with a new tire while we stood around like duds. Unfortunately Ploy did not have the correct tire pump insertion which left the new tire useless and flat. 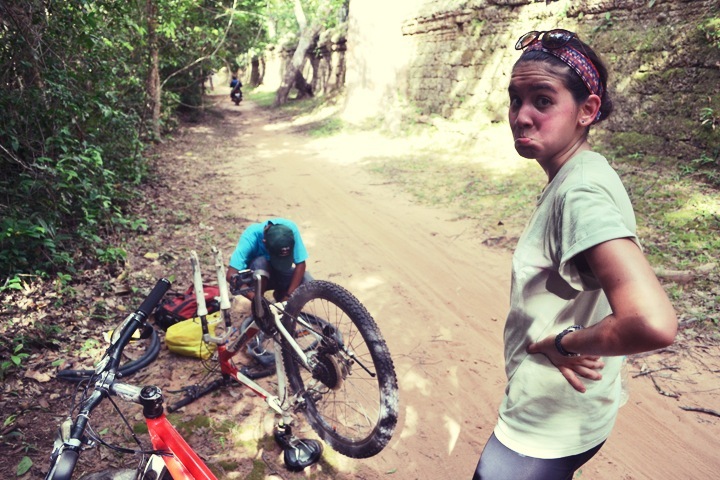 So Ploy asked around for the nearest bike pump which turns out was over by Banteay Kdei. 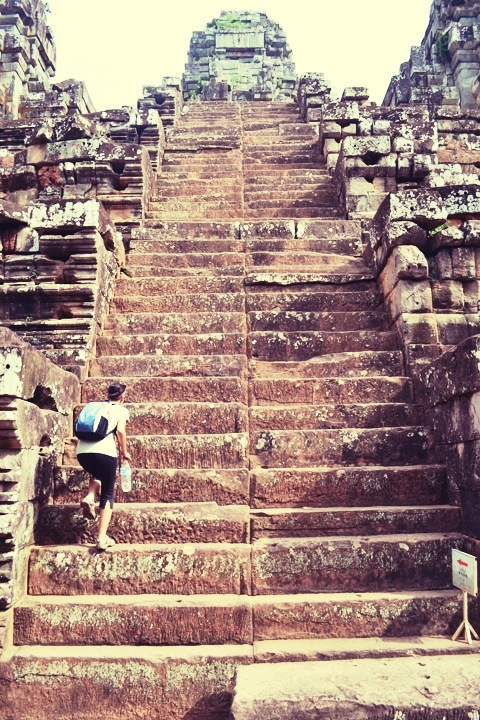 But how would we get all the way to Banteay Kdei? And walk we did. Kicking up dust, we walked next to our bikes for a few miles along the road and the off-road tracks through the fields and forest. We walked by herds of lazy cows and fields of tall grass that seemed to stretch on to infinity. It was actually very beautiful and I enjoyed taking in my surroundings, even if we weren’t getting very far. After what felt like forever, we finally reached the place with the tire pump. Hurrah! We were back on our bikes and speeding along the streets in no time. But the hardest part of the bike tour was about to begin. You see, to get back to the city we needed to take the main road out of Angkor Wat. This road is terribly long and straight and is full of bikes, cars and tuk tuks passing each other like maniacs. It was an absolutely terrifying (and painful) ride and I don’t know how we got out of there without being crushed in traffic. Navigating Siem Reap rush hour on a freakin’ bicycle is no joke. Thank you God for listening to my prayers and keeping us safe! 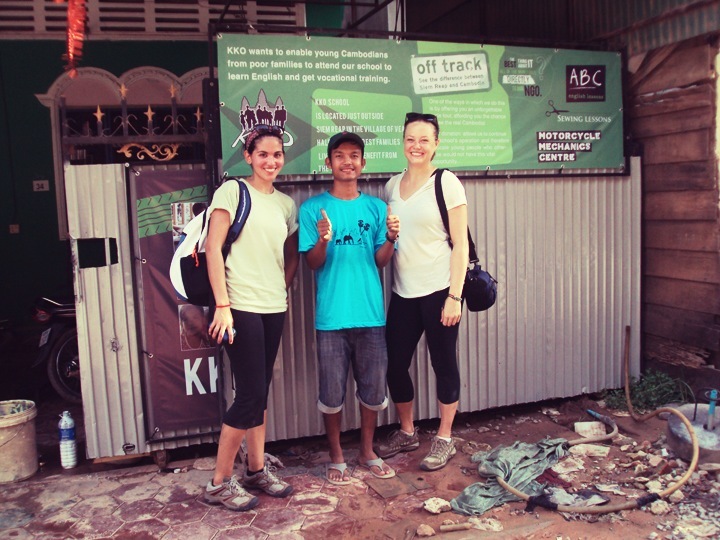 Despite all of our difficulties, the Off-Road Bike Tour with KKO was one of the best experiences of our entire Southeast Asia Trip. 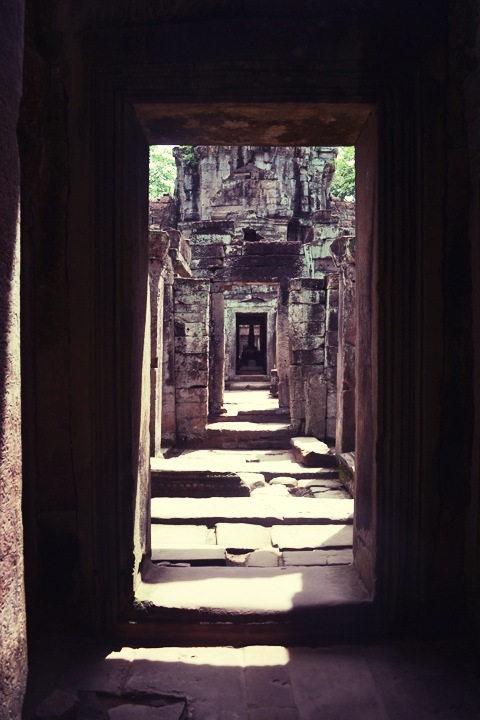 It was also, without a doubt, the best way to see the hidden, less-crowded and equally amazing temples of Siem Reap. We finished the day caked in dirt, sweat and smiles. 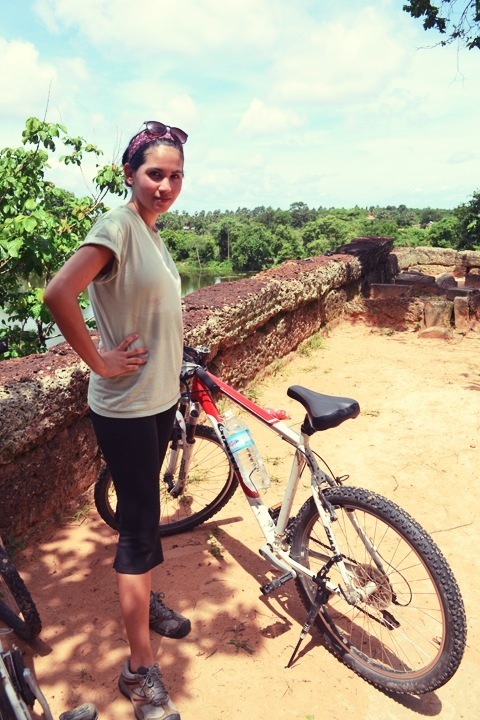 Biking around the back-roads and dirt pathways of Cambodia was challenging but also extremely rewarding. 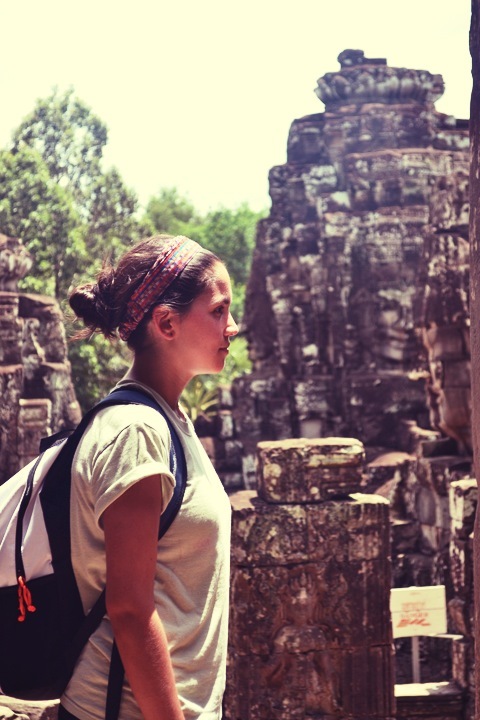 At the end of the day we felt like we had really accomplished something and seen a different side of Siem Reap. 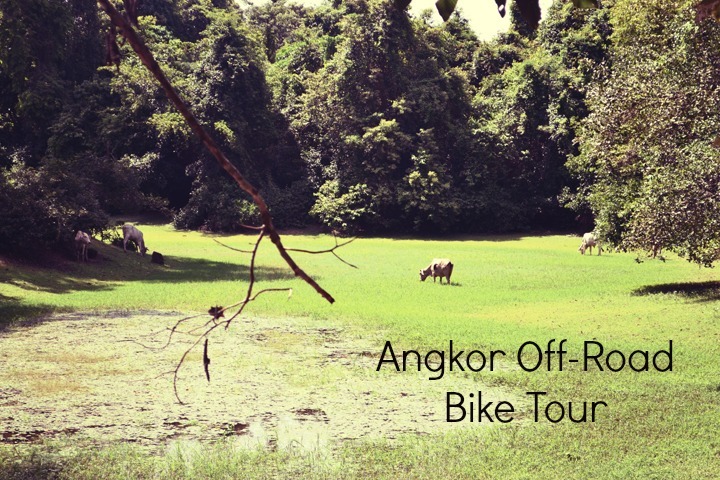 If you are ever in Siem Reap, please go on the Angkor Off-Road Bicycle Tour. They have a recommended donation of $40 per person that goes towards running costs and the KKO educational and vocational training center. It is well worth the cost!! Thanks again to Ploy for being an amazing guide and keeping us safe and informed. We had an amazing time! I have so much to comment on, but let me just say this: I was recently asked what my proudest accomplishment was, and I said it was this mountain biking trip. I’m so glad I went along with your daring suggestion!